Quick Weekend Pasta Dinner (Rigatoni with Savory sausage & Sweet Onions) – Serves 6 | Crappy Kitchen - Good Dinners! I don’t know what your weekend is like but for me I always move a little slower on Saturdays. The weekdays I am up early, busy all day and fall into bed exhausted each night, and so Saturday I think my body and brain go on strike in order to recoup. This means that making an easy dinner fits right into the relaxed pace I am in dire need of. The easiest dinner in the world! This is a family day for me, a day when I try to avoid having anyone over for dinner (unless of course it is a “weekend guest” weekend!) preferring to close the door on all things that are a hassle on Friday night. I love having friends over Friday as I am in work mode anyway and it is a great way to celebrate the beginning of a couple of days that are different from the rest. If I go grocery shopping on Saturday I make sure to buy some very convenient items with an eye on making my dinner prep a breeze. This Saturday I found some great seasoned sausage and knew it would be all I would need to flavor the whole dish (save for throwing a few fresh herbs snagged from my garden). A good pasta dish can be one of the most delicious things in the world to eat if it is mixed with the right combo of flavors. It was so good that if I had happened to get in over my head and invite people to dinner it would have worked out very well indeed. *Place the water on for the pasta. 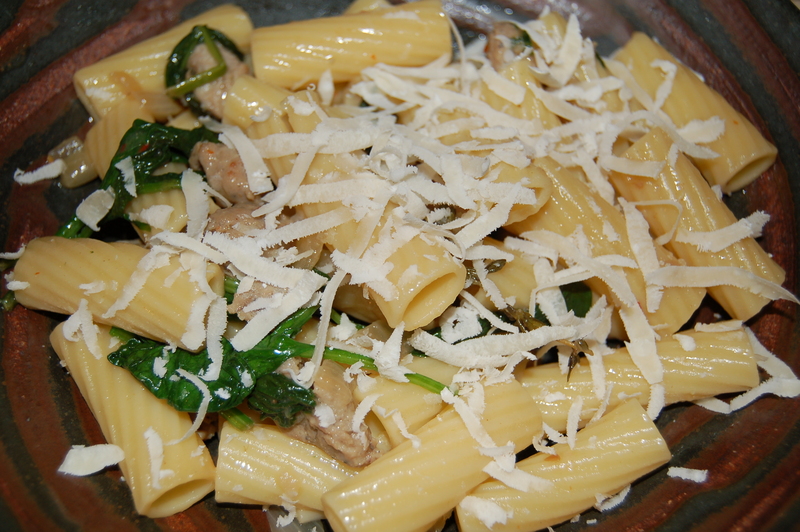 Rigatoni takes between 12 to 14 minutes to cook so plan on timing it to be ready when the rest of the dish is cooked. BEFORE YOU DRAIN THE PASTA WATER SCOOP OUT ABOUT 1 CUP AND SET SIDE. 1 – Place large pan (large enough to hold the entire finished dish) on low/medium heat and add 3 tbs of the oil. When it has wormed, Add the onions and garlic and cook stirring occasionally for 10 minutes, until nice and soft. 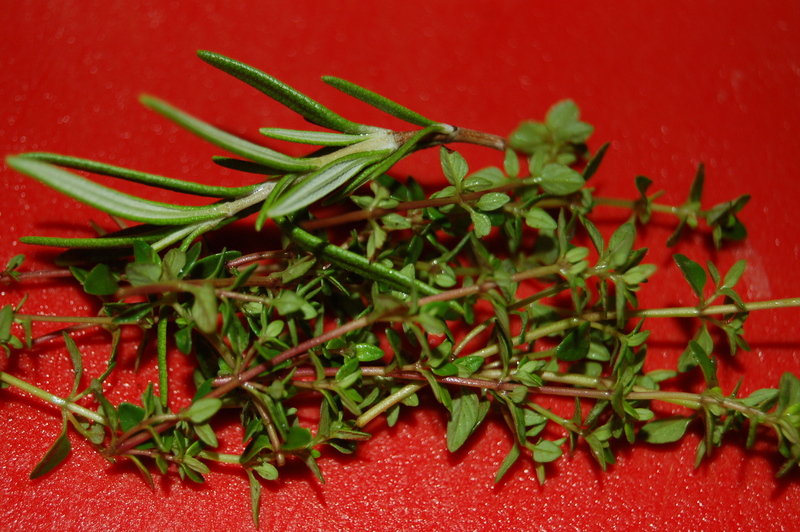 Add the herbs and pepper flakes (if using). 2 – Add the sausage either by cutting it was a scissors or breaking it off with your hands into the pan. Break it up further with a wooden spoon as it is cooking. Turn the heat up a little and cook until the sausage begins to brown a little and is cooked through (depends but anywhere up to 15 minutes). 3 – Add the spinach and stir quickly. Turn heat off, taste for addition of salt and add if you think it needs it. Cover with lid. until the pasta is ready. 4 – Add the pasta directly from draining into the pan (DO NOT RINSE PASTA UNDER COLD WATER), al with 3/4 cup of the reserved pasta water and cold butter. Replace lid and after a minute stir everything gently. Serve in warmed bowls and pass the cheese if you have it on hand. A few extra pepper flakes wouldn’t go astray either! Did I mention how great this tastes topped with the cheese of the gods: Parmigiano Reggiano! 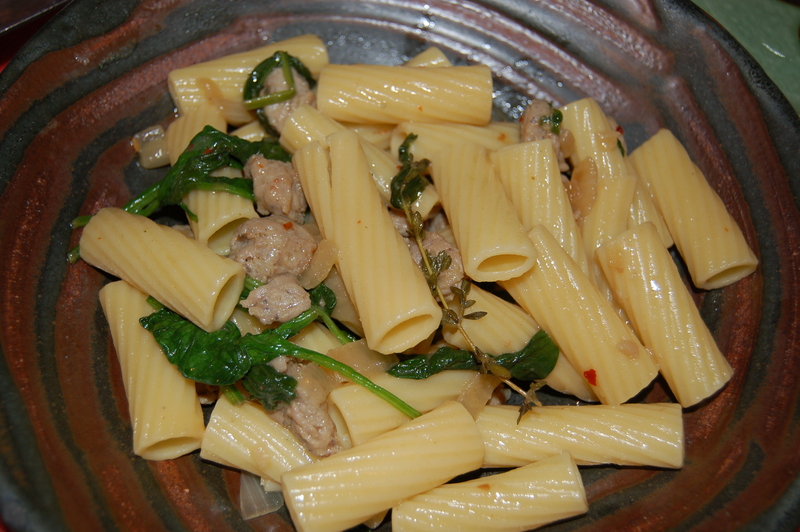 This entry was posted in dinners and tagged easy dinner, easy dinner party recipe, fresh herbs, fresh rosemary, pasta dinner, quick dinner, Rigatoni, rigatoni and sausage dish, sausage casing, seasoned sausage, thyme sprigs, weekend dinner. Bookmark the permalink.